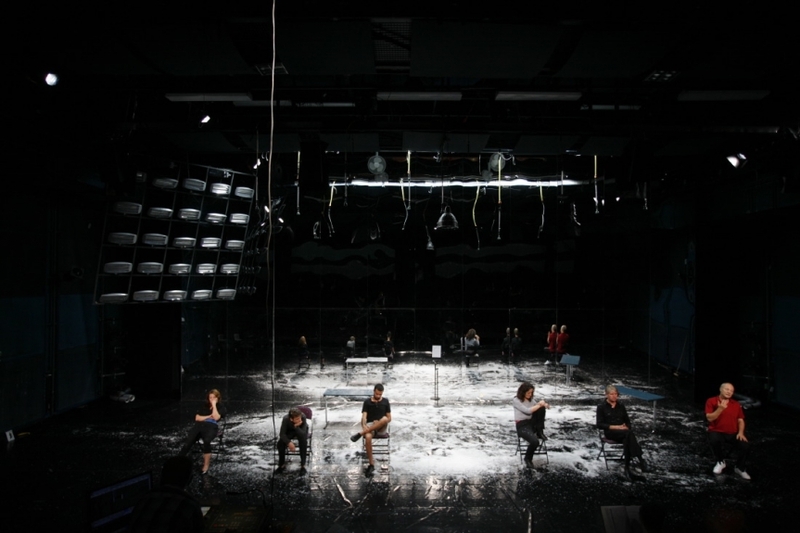 I think of the stage as an arena whose most basic function is to give us devices to encounter ”the Other in its Otherness”; to meet the Other, not in an attempt to understand – i.e. incorporate with my own subject – but in an attempt to remain in the movement towards an understanding, where the encounter exists only as long as the movement continues, and where the objective of the work consequently becomes to find strategies to avoid reaching the goal of the movement – the Understandment. The scenic creativity that emanates from non-identity thus becomes an unexpectedly concrete practice of non-understanding. The scenic act of the actor must be understood as a representative exercise, rather than a depicting representation; an act that opens to the co-creative act of the audience – the lingering eye – rather than asks for its passive consumption of finished objected. An investigation movement inwards in the text; to find the way for a free fall through the shaft that runs through the voids between the islands of already familiar knowledge, and where the most important condition is that we dare to abstain from the advantage of understanding that constitutes one of the most traditional priviliges of our profession. The skills of our craft thus should be founded on finding the movements that escapes the understanding; only there we and the audience become free to, simultaneously solitary and in community, discover the glimpses of understanding that make up our own subjects.